Georgian start-up carrier Myway Airlines, a project backed by Chinese investors, is suspending scheduled flight operations until March 2019, reports Business Georgia, citing Igor Aptsiauri, the airline’s commercial director and also its major stock-holder. The airline will retain flights on a single route between Tbilisi and Tel Aviv. A number of factors have contributed to the decision, Aptsiauri explains. Firstly, traffic numbers have fallen short of the projections, and secondly the martial law imposed in Ukraine since November 26 is also affecting Myway Airlines, which previously operated flights to Kharkiv and Kyiv. The martial law is in effect in the regions located along the Russian and Moldovan border, the Black Sea and the Sea of Azov coasts. As well as those two difficulties, planned aircraft maintenance checks – scheduled for January and February – will further challenge Myway’s smooth operations. The airline currently operates with only two Boeing 737-800s, although the original plan was to add two more of the type before the end of this year. On the tickets sales side, the airline is also facing the need to change its current distribution system, which has proven inefficient, he reveals. 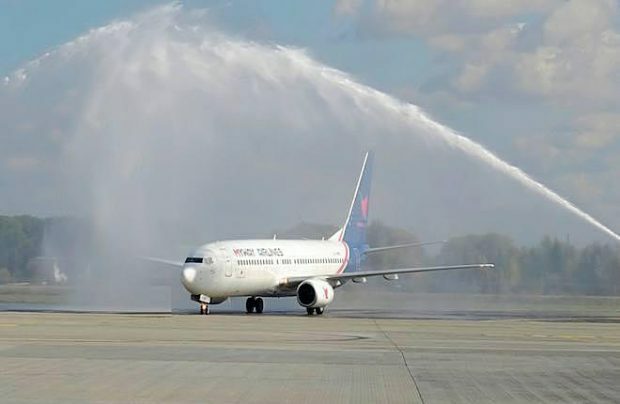 The Tbilisi-based airline has declined to provide further details on the situation to Russian Aviation Insider, but assures that all customers with tickets for dates up to March will receive a refund. Myway Airlines launched operations in March 2018. In the current winter season it had planned scheduled flights to Tel Aviv (Israel), Kyiv, Kharkiv (both Ukraine), Budapest (Hungary) and Rome (Italy). At least three routes to Russia were also on the agenda. The Georgian start-up was initially 100 per cent owned by China’s Hualing Group, which sold 51 per cent to Igor Aptsiauri in October. Having a Georgian citizen as its major shareholder was expected to help Myway secure much-desired commercial traffic rights and launch international services to key markets in Russia, Germany and China. Hualing Group positions itself as the largest investor into Georgia’s forestry sector. It is also in the process of creating a free industrial zone in Kutaisi and is involved in the construction business both in that city and in Tbilisi, Georgia’s capital. Myway’s market performance has been badly affected by the country’s open-skies regime, it is believed, in a situation that, according to local market players, has led to uncontrolled liberalisation. Local airlines are complaining of significant imbalances where they experience more hurdles launching flights to other countries than international rivals encounter when planning to fly to Georgia. Confirming this, Georgia’s Civil Aviation Agency’s data indicates that, in the period from January to September 2018, three airlines – Turkish Airlines, Hungary’s low-cost carrier Wizz Air and national flag carrier Georgian Airways – each equally controlled 11 per cent of the country’s air travel market.